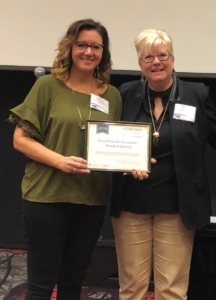 Jefferson Community Health & Life received the Rural Provider Excellence in Quality Award during the Nebraska Critical Access Hospitals Conference on Quality held Nov. 15-16 in Kearney. This is a new recognition that the Rural Health Association plans to give annually at the CAH Quality Conference. The award uses the iVantage measures as well as scores in the Medicare Beneficiary Quality Improvement Project. 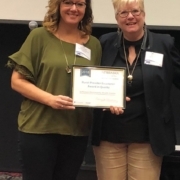 The Medicare Beneficiary Quality Improvement Project is a quality improvement activity under the Medicare Rural Hospital Flexibility (Flex) grant program of the Health Resources and Services Administration’s Federal Office of Rural Health policy. The goal is to improve the quality of care in Critical Access Hospitals by increasing quality data reporting and driving quality improvement activities based on the data. The MBQIP measures include ER transfer communication, CMS core measures in ER and immunization rates for patients. Erin Starr, Chief Quality Officer at Jefferson Community Health and Life, accepts the award from Nancy Jo Hansen, MBQIP coordinator.